Virat Kohli and Team India’s Gift to Shahid Afridi will Melt Your Heart! Team India is all hearts when it comes to expressing love for another countries player. Even though we have a strained relationship with our bordering country i.e. Pakistan, the kind of love India and Pakistan share in the world of cricket is exceptionally amazing. The two teams will fight it out on the cricket field, but post that things are peaceful and friendly. Recently, Shahid Afridi announced his retirement from International cricket and team India had a heart touching gift for the cricketer. 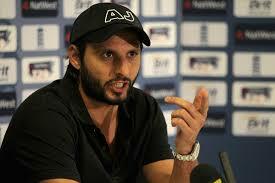 The ace cricketer ended his 20 years long International Cricket career that has set so many records. He has put up amazing matches against India, with some high moments and nail-biting sequences. @faizanlakhani I admire Kohli. It only he is great Batsmen but a great Human being and being aggressive in the field is his Class! !